The Original Homeschool Series by Charlotte Mason, 6 volumes, is the definitive guide to understanding the philosophy behind the method. You can read it online in theoriginal, a modern English paraphrase, or concise summaries. The series is also in print and available widely. A Charlotte Mason Companion by Karen Andreola is a more relaxed approach, but the book is very encouraging. AO Auxiliary member Brandy Vencel has some helpful tips to help AO beginners gather resources, plan a daily schedule, and get a vision for AmblesideOnline on her AfterThoughts blog . These are responses from members to real questions that were posted to the AmblesideOnline email list by beginners. Since most parents who are new to AO have similar questions, we thought these responses might be helpful. Welcome to AmblesideOnline and I'm sure you'll get wonderful suggestions from various parents with respect to your questions. I can speak to a couple of your concerns. Both my husband and I work outside the home (dh full-time, me part-time). You may want to join the http://groups.yahoo.com/group/WORKandHOMESCHOOL/ Yahoo list for support in this area, (or http://groups.yahoo.com/group/cmwhileworking/ which is more CM-based). Do your children go to day care? If so, send a tape player/recorder for them to listen to classics on tape and then do oral narrations while at day care. Narration is an essential part of AO. The year plan is an excellent guideline for providing a sound education using some of the best books known; the advisory and the list members provide ongoing support in the implementation of Charlotte Mason's principles of education and methodology as well as useful ideas on locating materials and seeking alternative or supplemental materials. Catherine Levison's books are also helpful "quick" references for implementation guidance. First, I printed a copy of the booklist for our year of study (Year One, last year). With this list in hand I checked off the books that I already owned, then indicated the books that are available at the public library, then identified books that were out of print. From there I started accumulating the books in a Rubermaid tub. I place holds on library books using the internet and I always carry my booklist so it is ever-ready when I'm in a used bookstore. I keep a copy of the weekly schedule in a binder and I check off readings as they are completed, making a note beside any for which an narration is made. Since our children have been in day care and since dh and I are employed as teachers our children were very aware of "school" and of course had a picture of it being great fun. My eldest was quite shocked when she found out that she would not be leaving home for school since her dear day care buddies and neighbourhood friends were all trotting off to kindergarten. We took it upon ourselves to provide opportunities for her to build a sense of belonging with the home-schooling community. This was accomplished by joining a homeschool co-op and seeking out play dates, swimming and other lessons, field trips, and sports days with home-schoolers. We also have held an "open house" each September to which our children invite all their public schooled friends for a tour and a taste of home school. At this point (6yo and 8yo) our children are more than comfortable staying home for "school" yet they still play very easily with their public schooled chums in the neighbourhood. I will mention that next year they will go to day care in the home of another home schooling family and they are overjoyed with this arrangement. Question: I was wondering what method CM was like? Is it structured or relaxed? I like the flexibility of homeschooling, but am currently using a structured program. I am looking for something more relaxed and informal. Answer: I think you will get better and more thorough answers to these questions on the Cmason list. You subscribe to this one by sending an e-mail to cmason-subscribe@yahoogroups.com . CM is not unschooling, so neither is AmblesideOnline. It's not exactly informal - but it is, in my opinion, more relaxed and interesting and pleasant than workbook/textbook based education. However, many homeschoolers do meld elements of unschooling and CM in a way that works very well for them - many of them are on the cmason list and can tell you what they do and how it works for them. Question: Can I school my 4yo and my 6yo together? My 6yo is academically advanced and working at a 3rd/4th grade level, which level would I start with? The years roughly are intended to correspond to grades, but this correspondence is not set in stone - and the grade levels are representative of the rigourous, challenging, and rich CM form of education rather than the typical American Public School education. Year 4 is considerable more difficult than year 3 (this is true of almost all curricula, by the way), as in year 4 the children begin reading Shakespeare's actual plays and Plutarch's "Lives." In general, the best year for each child is the year that challenges him or her without sending him or her to tears every time you open a book. The books should not be too easy, but neither should they be nearly impossible. It is not necessary that the child be able to read all the books himself. In fact, it is assumed that the parent will probably be reading the books to the child at least in years 1-3, gradually, as his reading level increases, handing the task of reading the books over to the student himself. Ideally, by year 4 he should be able to read them himself - but this is the ideal - there are many situations and circumstances where this won't be the case. When we began using AmblesideOnline I had a student in year 3 and one in year 4. The year 3 student did read all the books for herself, the year 4 student needed one or two of them read aloud. I did wonder if I'd made a mistake and should have switched placements, putting the older in year 3 and the younger in year 4, but the older girl rose to the challenge and by the end of the year had improved her reading skills by impressive leaps and bounds. I never cease to be thrilled, btw, with what this curriculum has done for this child in particular. It's been good for all of us, it's been all but the Bread of Life for this child. I would suggest looking over the books in each year. If your child has read all the books in year 1, then start with a different year. If he hasn't, go ahead and start with year 1, as long as he will be challenged by the material (this is just my opinion, based on a few sentences. You, of course, know your child far better, so can better judge). If one or two books in a year are too easy, you can always make substitutions. If most of them are too easy, you probably want a different year. Answer: Charlotte Mason didn't recommend formal grammar instruction until after age 10 or so. The first thing to remember with AmblesideOnline is that the levels don't necessarily correspond to grade. Are you familiar at all with Charlotte Mason's methods? This curriculum was created to implement the method's that CM found to be educational. If you are not familiar with CM, I would first do a bit of research. A good quick read would be "A Charlotte Mason Education" by Catherine Levison. That said, and if you are familiar with CM, I would first look at the history selections for each level and the literature selections and determine where you want to start. Level 6 history is continued from year 4&5 so you might want to use that history and pull literature from year 6. Years 1-3 use the same history text (continued from one year to the next) and then year 4 has its own history and "Child's History of England" [Dickens; no longer listed in AO] which is continued on to level 6. Only you can decide where your children's abilities are as to the reading. I have an 8 yos and an 11yos and we do history together - I had not done world history so we are using "A Child's History of the World" and I read it to them. My 11 yos is more than capable of reading it on his own but enjoys doing it with us. He probably could have read Van Loon's "History of Mankind" on his own but I thought he would enjoy this more and it was easier for me. If you have not done much oral narration with your children, you will want to start there before requiring much in written form. Even my highschool daughter does some oral narration. When they first start written, you don't completely stop oral. As far as when to start - only you can determine that. Many people on this list start at different times of the year. You probably would need to determine what you want your year to look like and then decide. For example are you going to school year round or take the summer off. If you are taking the summer off, then you would be able to get through one term before doing that. If your daughter wants to be able to be in level 7 by the fall, you may want look at the level 7 list and see if you think she will be ready for that and then prepare her by reading the books that are must reads before that. You can find that information on the houseofeducation site here at yahoo. It is for people using the upper level years. In vol 3, starting with Chapter 20, we start the final division of the book, "Suggestions Towards a Curriculum". CM calls the principles of docility and authority fundamental. While we recognize our authority as coming from God, she reminds us to keep the personality of the child in mind as we exercise this authority; offering ample opportunities for masterly inactivity. What is education? "Education is the science of relations", of course! Normal children have a natural desire for all knowledge (key word here is "all"). Our goal is that the child will develop relations in the present, the past and in the world around them. If the student succeeds in forming these relationships, he/she will experience a full life. Our role as teacher is to remove obstructions and to give stimulus and guidance--not to try and be their showman to the world. Motto of PNEU:"Education is an Atmosphere, a Discipline, a Life" - According to CM, these are the only three instruments lawful for use in bringing up children. Atmosphere - Parents/teachers should know how to make sensible use of a child's circumstances. Discipline - Train the child, establishing habits of good living. It may be easier to play on the child's sensibilities, emotions, desires and passions; but, the results from this course of action are disaster. Life - We nourish the child's intellectual life on ideas. CM quotes Matthew Arnold: education should aim at giving knowledge "touched by emotion". CM quotes others of her day who felt their educational system was turning out intellectual lightweights. She felt the student's tendency to cram for exams deadened their spirit of learning. She describes a young woman who "has little initiative, is slow of perception, not readily adaptable, not quick in the uptake;"--all from being over-strenuous and overconscientious. She says boys are less so affected. My daughter and son both started Apologia science this year. This is the first time they have ever used a "textbook" for science. I thought it might help them prepare for the high school and college classes they face. Well, just as CM predicted, I have a daughter who, at times, wanders around the house spouting memorized definitions in order to pass the exams with flying colors and who, at other times, looks like she can't take this for a minute longer. I have a son, on the other hand (same grade) who grumbles about "having to do this", but is not nearly as affected. They are both learning facts, but I have concerns about whether this is becoming knowledge in them. CM's accuracy about the nature of students is astounding. My daughter's behavior has been on the one hand comforting, that she can read, understand and pass tests, but on the other, I've wondered if she isn't just spouting information the way a computer does, without chewing the cud long enough to turn this into real knowledge. CM distinguishes knowledge from information. Information is the record of facts. Knowledge is what our mind does with this information. The child who gains knowledge (as opposed to just information), "will recast, condense, illustrate, or narrate with vividness and with freedom in the arrangement of his words." CM wants the child to incorporate knowledge--not just to remember the facts. She wants us to formulate a curriculum that appeals to the child's natural desire for knowledge. She felt an education that appeals to the child's other natural desires (for power, for praise, for wealth, for distinction, or for society) will destroy the balance of character. CM encourages a broad curriculum - the broader, the better, in fact. You never know when one piece of information learned (or converted to knowledge?) will serve as a hook for the child to hang the next new bit of learning that comes their way. My youngest son started showing an interest in gemstones shortly after we moved to a small town in NC that calls itself the "Gem Capitol of the World". We noted his interest and took him to several mines, bought him buckets of gem dirt and he learned from them how to identify various gems native to our area. He was so interested, that on birthdays or other special occasions, he would get gifts such as a miner's pick axe and goggles, his own gem screen for washing gem dirt, a gem ID kit, a mineral hardness kit, gems for his personal collection, etc. It wasn't long before he was mining the dirt in our back yard with his new gem screen during his times of masterly inactivity. Lo and behold, the boy started bringing me gems he was finding right here in our yard! In fact, one of their first finds, was a 20 carat colorless topaz and the next was a 20 carat sapphire. Prior to this time, he would run in the house and say, "Look, Mom, I found a ruby!" (or whatever - everything was a ruby to him at first :-) I'd say, "that's nice, Blake. Now go wash your hands for dinner," never dreaming he was REALLY finding gems. I thought it was just kids' play. Well, once he FINALLY got my attention, (It was that topaz! We had it cut into a 7-carat ring with two garnets we found. ), I realized he really WAS finding gems in our back yard. What a hoot! It has been a real learning experience for all of us, but had he not gotten those first learning hooks, he might still be shooting those little babies in his sling shot rather than making me beautiful rings and necklaces from them. Since then he has learned how to cabochon a gem and the basics of gem faceting (We bought a used faceting machine at a gem show we attended.) We hope he will get to attend a week-long camp this summer in gem ID, which is being taught by one of the nation's most experienced gemologists. I relay this example because he would never have bothered to look at the dirt, let alone ID gemstones from it, had he not already established that basic interest. I don't think gem ID is commonly taught prior to third grade, but we didn't let this stop us--the broader the curriculum the better. We are to offer a broad curriculum because we just don't know which idea will create the"ah hah!" moment for that child. This child of mine has discovered a lifelong love, if not a career in geology or gemology. It is his greatest passion. CM's parting thought is a plug for living books. Oral lessons or lectures should be limited to summaries, to expand or illustrate. If an oral lesson is done right, the children will be the ones asking the questions - not the teacher. Question: What grade levels (approx) do the AO years correlate with? Answer: The AO years roughly correspond to grades in school - year 1, grade 1, and so on - however, the grades are as they would be for children who have always been homeschooled by CM's methods, not necessarily as done in public school. And year 1 needs some adjusting to make it a little more doable for most 6/7 y.o. children. We hope to have that done by next fall. It is not our intention for the years to be a straitjacket that parents must fit their children into regardless of the fit. Did I say the correspondence of grade to year is a rough one? With that in mind, years 1-3 are markedly easier than year 4 - so if you have an advanced younger child it might be better to put her in year 3, rather than year 4, and vice versa - if you are starting with an older child, say, 12 years old - the work in year 4 will by no means be too babyish. Question: What do the asterisks stand for? Answer: The asterisks represent terms. One asterisk means the book is used in term one, two asterisks is term two, and so on. No asterisks usually means the book is used in all three terms. Question: Where do you get recordings of the specific scheduled pieces of music? Question: Which books are the very best for me to read in order to learn more about teaching the CM way? Answer: Volumes 3 and 6 of the original six volume series. If you cannot get to these, then Catherine Levison's books are good, but nothing beats Miss Mason herself. Question: I have 2 children who should be in grades 4 and 5. The younger one is not a good reader. Should I do the same year with both of them? Answer: You can do the same year with both. The most important thing to determine is that the material challenges them without discouraging them. Question: Is the main idea to simply read the required passages on the weekly schedule together and have them narrate them back to me? Answer: As soon as they are able to, they should be reading as much of the material as possible on their own. We tend to get more out of work we do for ourselves. And they should narrate in some form after each reading (to vary the day, their narrations can include sketches, skits, models set up with blocks--but should always include some oral narration as well).You can also spend a few minutes a week looking up places on the map and putting events they've read about into a timeline. Nature study and picture study are for the purpose of developing observation rather than gathering facts- there's more, and I'm sure you'll pick it up from browsing here, looking in our shared links, looking up some archives (and some are working on an FAQ as well) - so don't fret over it. The AmblesideOnline Curriculum is not only way of implementing Charlotte Mason's general philosophy of education. You probably can do school with your 6 and 4 yo together for most things, although you probably already know that math and reading/writing need to be tailored to their levels. You can undoubtedly choose books on history, science, or just literature that will appeal to both of them. AmblesideOnline follows closely the pattern that CM used in her schools and correspondence schools, so it tends to be more structured. However, it may still appear less structured than a text-book style curriculum. I wouldn't put a 6yo in any level of AO except year 1, unless you have already read all the books in year 1. Your child may be working at a higher grade level for things like math and writing, but the books are too good to miss. Most years of the AmblesideOnline curriculum are meaty enough to challenge children at a higher "grade level" than the year number. That is okay. We more or less followed the "forms" described by CM, and years 1-6 of AmblesideOnline are fairly equivalent to forms I and II - and children up to age 12 could have been in form II. I have a just turned 10 yo daughter and a 7 yo son. My daughter is in year 4 and my son is in year 2. I started with AmblesideOnline (then called PUO) when it started with then 7 yo daughter doing a mixture of years 1 and 2 so she did not miss out on any of the wonderful books on the year one list. I would recommend that you try to get a hold of Penny Gardner's "Charlotte Mason Study Guide." It does the best job of going through all the subjects and drawing out appropriate quotes from the series pertaining to these subjects. Then see if you can find Catherine Levinson's "A Charlotte Mason Education" and "More Charlotte Mason Education." These are very helpful practical books that make the ideas in the original series so much more accessible. Most folks suggest that you begin reading volume one in the series first as it is a general overview of her principles for the primary and elmentary grades. It is not easy reading. I read it along with the CM Series group via an e-mail discussion which motivated me to keep at it. What is usually recommended is that you read the booklist for each year and start using the year that has books that your child has not read. For your nine year old you may want to start in a higher year if she is an advanced reader. You could then assign her the books in the earlier years which she has not read as her free reading books or you could have her listen in when you read these to her brother, who you may want to start in year one. The thing to know is that years 1 and 2 and 3 use a lot of the same books which are continued in those years, whereas year 4 starts a whole different cycle of books. So you may have to jump into the middle of books if you start your daughter in year 2 or 3. Just be sure that your daughter is challenged in the year you start her. Many 9 yo's may find the year one readings to be too easy. First I list the stuff we do each day for each individual child. For my daughter it is Math, copywork, spelling/grammar, poetry and reading, for my son it is Math, copywork, poetry and reading. Next I put in another column the subjects my children do together both daily and weekly subjects. In the daily column I have Family Worship, Bible, and English From the Roots Up. I then add in the weekly subjects we do together. Monday is composer study, Tuesday is picture study, Wed. is Nature study. Thursday is a drawing lesson and Friday is folksongs/hymns. Then I look at the weekly readings for other subjects according to the 36 week schedules. I decide if the reading needs one or two days to complete based on 20 minute lessons. Then I try to divide those readings somewhat evenly between the five days of the week, trying not to put all the different history readings or science readings on the same day. For example, on Monday my daughter has "A Child's History of England" - first half of week's reading, Bullfinch's "Mythology" - first half and "It Couldn't Just Happen." My son has Hillyer's "Child's History of the World" and "Pilgrim's Progress." I use the forms in The Homeschool Journal using three vertical rows of boxes for each week-my daugher's individual list, son's individual list and combined subjects. To save time this year I photocopied the forms with the daily stuff already written in so I do not have to write the same thing over and over again. For dd I read the really hard stuff like Bullfinch's "Mythology" and we buddy-read the medium stuff and she reads on her own what she can. I do most of reading to son except for the additional reads which he reads aloud to me such as the d'Aulaire books. While I am working with my daughter, I have son do things on his own such as copywork math or chores and vice versa. I have each one narrate after each reading. My daughter can narrate at the end of the day's reading. My son often stops me in the middle of the day's reading and says he is ready to narrate. After his narration I finish the reading and he narrates the remainder. The trick will be next year when I have another son starting in year 1. I am thankful God gives us the grace we need at the moment we need it - not neccessarily the moment we are worrying about the future. As Elisabeth Elliot says, He gives us grace for the reality and not our imaginings (very loosely paraphrased). I hope you get the idea! I hope this encourages you. This is our third year using AmblesideOnline and I enjoy it as much or more than the children! When to begin? Should a 6 1/2 year old begin in year 1? I would start your 6 y.o. with year 1. I would also take a look at the AO website (amblesideonline.org) and look at Year 0. This isn't really a booklist. I'd take a look at what's there. An important part of a balanced CM diet, a full CM education is the outdoor play recommended for the lower years--the free time, the time spent building up experiences with real things, with mud and sand and water and trees and rocks and bugs and flowers, with running, skipping, jumping, climbing and more. CM believed that a child who has played in puddles will have a better grasp of the concept of a lake when he is older than a child who spent more time inside than outside. So you could use the information in Year 0 for 'summer school,' and then begin your then 7 y.o. child in year 1. I have seven children. My youngest two are 3 and 6. My 6y.o. just had her birthday a couple weeks ago. She's a bit of a livewire and a free spirit (we've had more emergency room trips with her than with all the other six put together) and I am waiting on beginning AO with her until the fall, when she will be 6 1/2. I think she'll be ready then. I have a couple of suggestions to those new members who have asked for ideas on how to get started. Here are some things that have helped me. In fact, I have found the archives full of helpful suggestions. It just takes a lot of time to read through them all! If you start with Donna-Jean's three posts first, you will find ideas on how to get started today. Then, as you have time, you can work your way through all of the other helpful archived posts. One other search tip you may have already discovered:if you find a list member whose child sounds just like yours, or whose child has special needs just like yours, and you would like to read all of their posts without sifting through all of the others just then, try typing their name in the search archive function, and all of their contributions come up. For instance, say I find a number of Wendi's posts filled with helpful information that I feel is useful to me; I can type "Wendi" into the search box, and get all of the posts with her name in them. (Great search by the way!) Or, if my child is dyslexic, I can search the archives using the word dyslexic or dyslexia and find every post in the archives related to this. In doing so, you are sure to find helpful suggestions about using the AO curriculum and adapting it to your family's special needs. You are still going to get some posts that are unrelated to what you are looking for, but it does help immensely to weed through unrelated posts and zero in on the type of information you need at that particular moment. Also, don't forget to check the AO bookmarks & file pages [at the yahoo email list] for more great information and links to other helpful sites. I hope this information helps someone else as much as it has helped me! I think one way for moms to see for themselves what kind of difference there is between the original story and an abridged version, is to read an abridged classic first and then read the original. I had this experience recently when a dear friend had cautioned me about Alexander Dumas' "The Three Musketeers." I had recently purchased it at a garage sale and it did not say it was abridged so I assumed it was the original. I read it and thoroughly enjoyed it. I compared my book to the one at the library and found that mine was abridged. I read the original story and was AMAZED at how much more rich the story was! It was like night and day! Remember, I enjoyed the abridged one, but I was thoroughly captivated by the original! Try it for yourself. (Although Dumas' book may not be a good choice as adultery is rampant and encouraged.) Take the time to read one and I think you will clearly see the difference for yourself. I don't know if this will help answer some of the questions recently asking about how to start and where to start, but it's an attempt roughly compiled from three or four previous posts on the same general topic. How to implement AmblesideOnline's program in your homeschool is really something that only each person can decide in the end because only each individual mom knows her children well enough. AO is based on Charlotte Mason's ideas and practices. This means that compared to current standards such as are generally found in public schools, AO is fairly advanced. "Kon Tiki" (year 4 or 5), after all, is usually in the adult section of the library - but it's very engaging. In selecting material, it is important that the material shouldn't be too simple. It should be challenging to our children, something they work at and think about, without it being so difficult they would rather be hit in the head with a baseball bat than do school. For that reason, I don't do have any two children in the same year. I didn't have two children who were doing the same level of work. If I'd started with two who were very close in reading/academic levels, I would have put them in the same year. It's also an important tenet in Charlotte Mason's philosophy that the children read their own schoolbooks themselves, as much as possible. Reading aloud when the book is too hard, when it has parts you need to edit, or when it is a free reading book is fine - actually, of course, it's fine anytime you want to do it, but it's more 'CM' not to read aloud school books the children can read themselves. I have heard sad tales many times from overstressed mothers who thought they had to read every book aloud in order to educate 'the CM way.' It simply ain't so. =) So, if you like doing it and your children do get a chance to do some of their own reading at some point, then by all means go ahead and keep reading aloud lots of books. But don't feel compelled to do it if it simply doesn't work for your family. Just keep in mind that as much as possible, the students should be able to read their own schoolbooks, and that will help you select the appropriate year. In general, I would start a 6 y.o. with year 1. I would not, personally, start a child younger than 6 on year 1 of AO - though this is a personal choice others need to determine for themselves. I would also take a look at the AO website (www.amblesideonline.org) and scroll down until you see 'year 0.' This isn't with the other 'years,' because it's not really a booklist. It's listed lower on the page with other articles. If you have a child age 6 or 7 or younger, I'd take a look at what's there. An important part of a balanced CM diet - a full CM education - is the outdoor play recommended for the lower years - the free time, the time spent building up experiences with real things, with mud and sand and water and trees and rocks and bugs and flowers, with running, skipping, jumping, climbing and more. I wouldn't rush a child and skip this stage to get to year one too soon. CM believed that a child who has played in puddles will have a better grasp of the concept of a lake when he is older than a child who spent more time inside than outside. If you have an older child,you'd need to look over the books and see what they've already read and what falls in with their reading levels. The years only roughly correspond to grades - because following Charlotte Mason's methods results in an advanced curriculum. So you'd need to look at a couple sample books from a year and compare that to your children's reading ability. It's also fine to just choose the year that most corresponds to your child's grade level (year 1 - first grade; year 4-fourth grade). Your family might have some special needs children that would make the situation different. This level of literature might be new to your child. You might need to combine years.I can tell you that I think, like most curricula, year 4 is a jump in difficulty. So I would think you definitely don't want to put older children in anything lower than 4, but even 12 and 13 y.o. might find year 4 enough of a challenge. Or you might settle on a year but still need to make adjustments to tweak it to suit you. There are a variety of ways you can adapt the material to suit your family's unique circumstances. When I began I had a child in year 3 and a child in year 4 (plus a toddler, two teens, a special needs child and a baby on the way). We had read many of the books listed as free reading for those years, but had missed some books listed in the earlier years. So we incorporated those earlier books into our school year, some in free reading, some in school work. It just depended on the book. If you decide not to put two or more children in the same year it will also be much easier on you if the children are reading most of their their own books. I personally found it easier not to combine grades, for many reasons. I've heard this from other moms, as well, who were just as surprised as I was at how much easier it was to have the children in their own years for most of the material, reading their own books. If I had two or more students who could not read their own books, then it would be simpler to combine years. Here's another way we adjusted to suit our family: In our case, the first year we used AO the material was fairly easy for one of our girls, but it was harder for her older sister. Moving the younger girl ahead of her older sister would have worked schoolwise, but it wouldn't have been good for the character of either of my children at that time (it might work just fine for some other set of children or even these children at some other time. This just wasn't a good option at that time). So I supplemented the younger girl's reading with much more difficult books and chose easier books for the older girl's free reading. I also adjusted the schedule so that the younger girl, who read faster, would, for example, be given fifteen mintues to read Plutarch twice a week while the older girl had Plutarch for thirty minutes four times a week. This worked for us, and now both girls are finding a comfortable pace to work through the material, the older girl a year ahead of the younger. In fact, it worked incredibly well for both these girls. The younger, faster reader had had a tendency to gallop through books without ever stopping to look at the terrain and think about the ideas. Giving her harder books and making her stop sooner gave her an enforced amount of time when she was dying to get back to that book, so she ended up thinking much harder about her reading. The older girl increased her reading speed and skills and gained confidance - it was a major ego booster for her to learn she was reading some books that many adults she knew either never read until college or not at all! Charlotte Mason's ideas are also a case of 'less is more,' fewer books, better quality, more time spent reflecting and discussing the ideas in the books, so don't try too hard to cram in a lot of reading just to get through the material. Coming out of a term with two or three really deep ideas is better than coming through with thirty books under one's belt, and no deep, reflective power. Question: Should I start my child who is new to this in an earlier year? Will that put him behind? Answer: Only you can make the decision in the end, but I can tell you that I don't think you need to worry too much about an earlier year putting him 'behind.' IMO, AO is far in advance of public school programs, because a CM education is far superior. I also think that if he is put in a level that is too challenging, he won't progress very well anyway. It's important to find that level that is challenging, but not so hard that they just tread water all year, or feel like they are constantly on the bleeding edge of learning . When people first started using the original version of the curriculum many people put their older students in year 1 along with their younger ones. A number of them later shared that they were moving their older students into another year. Sometimes it was because their students flourished and were ready for more challenging material and sometimes it was because the material was really too easy though still enjoyable for their students. The new year 1 is more appropriate for 6yo's than the previous material, so I would carefully consider the abilities of the student before putting a 9 or 10 yo student in year 1. You might want to test them a little before choosing a year. The students should be challenged but not frustrated with the material. Question: Should I put my child in their proper year, and have him double up on his history to catch up on history for previous years he missed? Answer: Not exactly, I had envisioned a child gobbling up all the books on our additional reading list and then looking around for more books to read to themselves. In that case, I would look back to the earlier years and find extra reading, literature, and biographies as reading to consider giving them. It might not be a year 4 student who needs all this extra reading, it might be a year 6 student or a year 3 student. I wouldn't suggest that a parent work overtime reading aloud great quantities of extra additional reading with the child. The parent's read aloud time is a privilege for the student, and students need to be encouraged to read for themselves as they become ready to do so. Independent readers can catch up on literature and biographies from previous years during their own free time if they are interested. We are hoping that they will become interested. Older students may or may not have had compatible lessons in history before coming to AmblesideOnline, but hopefully they have had some lessons. Even if they haven't, I'm not sure it is fair to the student to expect our students to catch up on a great deal of material that they could have had if things had worked differently. Such expectations may unfavorably impact the students reception of the new history lessons. Even if students don't get a whole sweep of history by grade 7, if the student enjoys and explores a few time periods then the time spent with AmblesideOnline was well spent. If they realize that something is missing, that is even better, especially if they are curious enough to research it themselves. If they ask, you can help then with some great resources that you just happen to know about from the new revisions of AmblesideOnline. What I'm trying to say is don't worry about missed history, but work toward enjoying the history studies you are choosing to do with AmblesideOnline and part of that enjoyment is accomplished by lingering a while and studying history slowly. Where the child is still working on reading skills, I would consider dropping back to give the child time to improve their reading skills. CM's students were classified into forms where all the students did the same subject matter but at different levels. Students still working on their reading would stay in form I (years 1-3) until they were ready for the more challenging work of form II (years 4-6). Our current schedule isn't quite as accommodating. Our year 4 can be modified slightly to make it less challenging, but year 5 isn't really as easily modified. And ultimately, you want your child to be prepared for the more difficult work in years 7-12 as well. It is difficult to predict how quickly children will improve their reading and be ready for more challenging reading. Since you know your child best, you are the best person to tell how to proceed. I think that skipping some material is generally preferable to doubling up or speeding though large sections of history for the purpose of catching up. However, I'm speaking in general about large adjustments covering years of material, not smaller adjustments such as I need to make with my two boys. I have a son in each of year 2 term 2 (not an independent reader for school books) and year 3 term 2 (mostly an independent reader). We are out of sync with the new AO schedule and were never really completely in sync with the old one. We have been using a combination of the old and the new texts and neither is quite where they need to be for the new schedule. My year 2 student is about 15 chapters in "An Island Story" behind where he needs to be, but he has already read the biography of Columbus and Lief. So he really doesn't need to read "This Country of Ours" this year. In this case, I am planning on adding these extra "An Island Story" chapters to his readings. This student is way behind in "Child's History of the World" (in Persia) so we will jump ahead and pick up those readings where the new plan kicks in for term 3. My year 3 son is only a little behind in "An Island Story" (about 6 chapters) and is very much ahead in "This Country of Ours" and "Child's History of the World" (I am undecided if I will ask him to finish the book). He will be getting additional biographies (and possibly literature) until we are caught up to the "This Country of Ours" schedule in year 4 term 2. But he will have to read those extra chapters in "An Island Story" while we finish our term in the next few week and start term 3. The total reading will be about the same as on the new schedule. Question: Should I have my older children listen in as I read aloud schoolbooks for the younger siblings? Answer: My year 3 student likes to listen in on reading he did last year when I read aloud to my year 2 student! I don't encourage it, but since he stops working on his own while I read aloud, I try to schedule my year 3 student with copywork, drawing or some other skill compatible with listening during my younger son's readings. Question: If I don't start in year 1, what about all those chapters we've already missed? How do I catch up on those? Answer: I'm trying to encourage people not to worry about it. While the first 21 chapters are only 93 pages this is a significant amount of detail for 7 and 8 year old children. Adding 93 pages to year 2 readings almost doubles the amount of material to be covered. Here is my narration of a 10,000 foot view of early English history. Perhaps it can fill in the gaps for you. "An Island Story" starts with a myth about how the island came to be known as Albion after Neptune's fourth son and also known as Britian after Brutus, a prince of Troy who settled and ruled there. The story picks up when Julius Caesar attempts to conquer the island. Eventually the Romans were successful in conquering the British Islanders, but it was a shaky conquest at best. When the Roman Empire began to fall it fell in Briton first, but not before the Romans had introduced reading and writing, education, straight roads, walls to keep out the wild Pict and Scot tribes of the north, and most of important of all, Christianity. The early Britons were Druids before the Romans came but the Britons were Christian when the Romans left. Britain was Roman for about 500 years, but when they left, the Picts and the Scots started trouble again for those who lived in the south. Civilization deteriorated. To make matters even more difficult, a wild pagan tribe, the Saxons, invaded the island. For a brief time a king known to legend as King Arthur brought a temporary peace to the island and held off the Saxon flood, but soon the Saxons were rulers of the island. Eventually these barbarians also became Christians and the southern portion of the island, England, took the name of one of the Saxon tribes, the Angles. The English were named. About 900 a wise Christian Saxon King, who could both read and write, unified the Saxon Kingdoms in the face of a terrible flood of new invaders, the Danes, who were Vikings from Denmark. Alfred eventually made peace with the Danes and they also became Christians, but England continued to have trouble with the Danes for quite a while after that first peace was made. Chapter 22 begins the short reign of King Harold who ruled England during a major pivotal point in England's history. The study of Year 2 history starts with the invasion of the Normans (who were Vikings who has made peace with the French king about the year 900 and settled in down in France in an area now known as Normandy) into England in 1066 and what happened after that. You may want to include the chapter in "A Child's History of the World" about Alfred. We omitted it from the schedule because "An Island Story" does a excellent job of covering him with about 3 chapters. The chapter title is Getting a Start and it is Chapter 48 in my 1997 version of "A Child's History of the World" and chapter 46 in the Sonlight original version. Question: Is there a list of books I can use to supplement history chapters? Answer: We haven't done one; the reading list is pretty full without the addition of supplemental history books. Unless your child wants more, it might be too much of a load to add many extra books to the curriculum. If your student wants to know more about a specific era or historical figure, you might check out a booklist that lists books by historical period/event. I think there's one called "Let the Authors Speak" by Carolyn Hatcher, and there may be such lists online. Question: How do you stay focused on Charlotte Mason's method when faced with so many homeschool options and catalogs?? Answer: Part of what you are experiencing here is simply normal for homeschoolers, and you may experience these "symptoms" for 2-3 years or more! A lot depends on how much reading/research you do on your own, and how quickly you find the methods that fit your family. "The perfect curriculum" is a myth. There's not a curriculum on the market that hasn't been a miserable failure in somebody's home, somewhere (probably including AmblesideOnline, although I've never heard from anyone like that). I would almost tell a new homeschoolers that you can expect to choose something curriculum or program that not work in your home. Picking and choosing from this and that - "eclectic homeschooling" - is a popular thing to do, but it works best for moms who know their children's learning strengths/weaknesses well and have clear goals of their own. Others find the "safety net" of a pre-planned curriculum gives them the freedom to make the program work for their family while knowing that "someone" has marked the path for them. I'm better at "long answers" than short ones, but the short answer is that no one can tell you "should" do. There is time to incorporate different educational philosophies--my only caution would be to make sure that the philosophies don't conflict with each other. You won't get the "best results" from any of them under those circumstances. 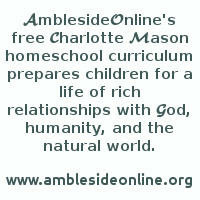 AmblesideOnline is laid out as a curriculum, but it's rather meaningless apart from the philosophy of Charlotte Mason. Other curricula follow different philosophies, and some curricula are adaptable to different philosophies. My instinct is to suggest that you make whichever philosophy is closest to your heart and seems most "true" to you the "trunk" of the tree. You can allow other philosophies to branch off the trunk, if it can support them. Also, following my "tree" analogy here, you might want to focus on your preferred philosophy long enough to let it strengthen before you add in too many other things. Trying to do everything at once, right from the start, is the road to burnout. P.S. About those catalogs...all I can say is, as the years go by they will be less enticing. In the mean time, there's not much you can do unless you have the will-power to leave them unread. The AO curriculum can be VERY flexible. The basic outline can be implemented in many ways, according to your child's needs; and those needs can change over time (for instance, the child becomes a more independent reader, so you restructure some of his school time to reflect that). My oldest child is finishing her 6th year of homeschooling (the last 3 using AmblesideOnline) and I'm currently experiencing something I think is akin to the 7-year-itch problem in marriages. Every time I hear about what someone else is doing I think "oh dear, maybe I should have done it that way instead, maybe I should start all over again." However, I realize that the problem's not the curriculum at all; it's more a need to readjust the school schedule, talk with her about expectations, and find ways to use her strengths and build up some of the weak areas (for instance, building skills in written narration). AmblesideOnline and Charlotte Mason's methods are the framework we're using for our "tree", as Karen said, and, as others have mentioned too, they can accommodate the stages of a child's growth and the needs of different families. Question: Can I give AmblesideOnline a two-month trial with my 6 year old? Answer: If I had a 2 month trial period to tell if homeschooling or AmblesideOnline was working or not. I definitely would try too hard, and end up overworking myself and my victim, er ah, student. You should probably take a step back and discuss with your dh what constitutes 'not working' and what would a 'working' school day look be like. You probably don't expect your 6 yo to learn how to read in 2 months, or be a brilliant narrator in 2 months. But, just what will your husband expect? In my school, I expect that by the end of the first 2 months of school we should be using a schedule that actually resembles what we can do on a good day. The pace of the books won't be too much more than the children can handle, and we will finish late only 4 days out of 5. I teach 3 children, year 6, year 3, and year 2 and I've been home schooling my 12 yo from the beginning of her schooling. I just wanted to caution you to not expect "great progress" in that first couple of months. Great progress, when it happens, is usually somewhat unexpected and happens when the child really groks something. You should to carefully consider the child's level and start him where he needs to be. Introduce the lessons somewhat slowly and keep them short, 5 to 10 minutes. It is very easy to overwhelm a 6 yo. Introduce the subjects you enjoy and which your child will enjoy, first, and interlace them with more demanding lessons. Don't try to tackle too many new things all at once. Remember, that you are just beginning to train their attention in each different subject. We all make adjustments to our schedules, especially with how much reading, narrating, writing and math the children would be expected to do, because there is usually room for improvement. Also, sometimes, discipline and just sitting down to school work is an issue, especially with a 6 yo who has never done schoolish activities before or is not required to do tasks at home.